This was our favourite Casa in Cuba! 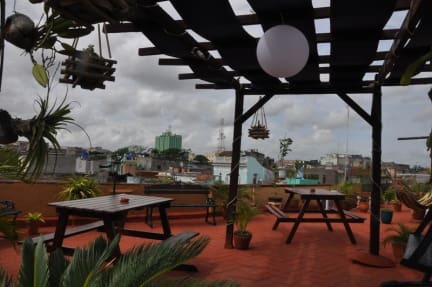 It had everything: clean rooms, great location, an amazing rooftop with beautiful sunset views and the owners were so friendly and made us feel right at home. The breakfast was so good - probably the best we had in Cuba. The whole family, we stayed with Luisa across the hall as well, made us feel so welcome and we had lovely coffee and chats. Can't recommend it enough. You'll want to stay in Santa Clara an extra night just to the enjoy this great casa. Arelys and Ernesto run a lovely casa near to the centre. So very welcoming, helpful and friendly. Excellent 5 CUC breakfast on roof terrace. The hosts clearly enjoy and are interested in their guests. Ask them about their flag collection! Me and my girlfriend had an excellent stay at Hostal Hyggelig. 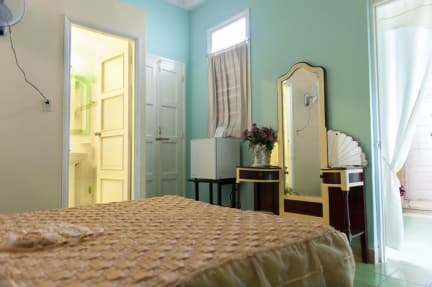 The place is super central to all the key attractions of Santa Clara, the rooms are great and very tidy, and the breakfast (extra to the room rate) is one of the best we had in Cuba. Ariel and Ernesto were also super friendly were a great help in planning our stay. We can't speak highly enough of our stay in Hostal Hyggelig in Santa Clara. Upon arrival we were greeted with complimentary cocktails. The owners were very friendly and hospitable. The rooms were spacious and clean. The casa has a vinyl player with an array of records and a rooftop balcony with views of the city. We also received an unbelievable breakfast - the best out of any casa that we stayed in during our 14 day trip in Cuba. It's guaranteed that you wont be able to eat it all! Thoroughly enjoyed our stay in Santa Clara which was massively enhanced by our stay in this hostel. The hosts are truly lovely and friendly people, we spent a good few hours with them in the middle of a tropical storm, and they went out of their way to make getting round Santa Clara easy. They have their own wifi and will give you the cards for it, and the breakfast was delicious and good value for money, with the added bonus of the lovely rooftop terrace. overall I must say, that we really enjoyed our stay at Hyggelig very much!!! The owner and her daughter are super lovely and friendly, the rooftop terrace has superbe views and the breakfast was the best we had in all the casas!! Thank you very much!! Any time again!!! Great breakfast on a nice rooftop-terrace. Really nice place to stay, very helpful and friendly hosts. Wauw! I really recommend this place if you want to stay in Santa Clara! Rooms are big, there's a roof terrace and the breakfast was amazing!